Every time a toilet is flushed in Brisbane's south and west it could be contributing to the fuelling of Australia's first poo-powered car. Queensland Urban Utilities is saving millions of dollars every year as it uses the city's toilet waste to power up to 50 per cent of two of its largest sewage treatment plants, and now one of its fleet cars. QUU spokeswoman Michelle Cull said one day the sewerage and water provider hoped to have an entire fleet of cars that could run on human waste. "At the moment we just have the one car, but yes, we do have plans to hopefully one day power our entire fleet by poo," she said. Ms Cull was quick to debunk myths about the QUU car. "We get asked all sorts of funny questions like does the car smell, or does it leave skid marks," she said. "No, it doesn't smell at all – because it's an electric car it doesn't even have an exhaust pipe so it doesn't have any emissions." 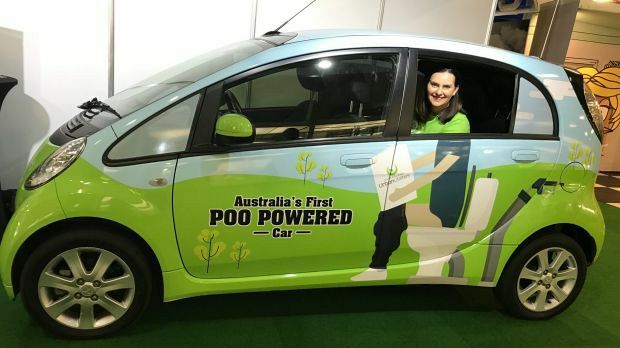 The car, branded with a toilet on the side, is understood to be the first of its kind in Australia, and runs on electricity generated by the city's sewage. To run the car, sewage sludge is broken down to form biogas which is then used to drive an engine to create electricity. "We get about 20 Olympic swimming pools of waste per day at the Oxley Creek Treatment Plant," Ms Cull said. "We've got an endless supply of fuel, so it makes sense to be turning it into something useful." The sewage-generated electricity saves the company about $2.5 million a year in electricity and running the Poo Car off sewage-generated electricity saves QUU about $1900 in petrol costs. Residents wanting to learn more about the car can find it at the QUU stand in the Agricultural Hall at the Ekka. Visitors to the QUU stand will also be able to walk in a giant replica sewer pipe and meet a life-size toilet roll family – the Rolls.